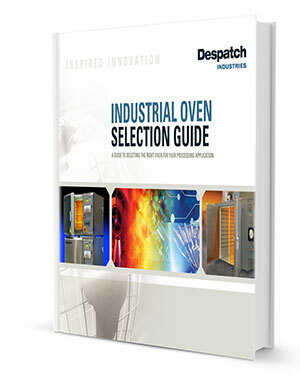 Despatch, is expanding its line of PTC top-loading ovens to include a new 48 cubic foot model. These ovens are specifically designed and used for burn-in, qualification testing and calibration of down-hole drilling instruments. With recent advances in technology and a wider range of processes, a larger oven is required which will accommodate larger tools and instrumentation. While the PTC oven is designed to stand up to harsh oilfield conditions, it is also used for other applications that require a long narrow chamber. Customers have used the PTC oven for curing wire coatings in a continuous process configuration. Marinite end-caps can be machined to insert instruments, testing leads or tooling and can also be removed to allow two ovens to be used end-to-end for longer loads. The new 48 cubic foot PTC chamber is 24 inches high by 24 inches wide with a twelve-foot length. The oven can reach temperatures up to 500? (260?) and features horizontal airflow with adjustable louvers to ensure uniform airflow across the entire length of the chamber. The top-loading oven allows heavy equipment to be loaded into the test chamber by crane and silicone door seals and positive-latching clamps hold the door securely in place.